At Last, Bowser's Castle! is level 5-8 in Yoshi's Island DS, and takes place in Bowser's Castle. Yoshi and all five babies went through this castle to save Baby Luigi and the other captured infants. Yoshi finds Baby Wario and Baby Bowser fighting at the beginning, and the two rejoin him. At the start, Yoshi has to make his way through many Skeleton Goonies and platforms to make it to a door at the end. Inside the door is a rocket, which takes Yoshi into outer space. After getting past all of the planets and Rocket Guys in space, Yoshi falls back down to the castle, which has a Stork Stop and five different paths for Yoshi to take. Which path he takes depends on which baby he has with him. In Baby Bowser's path, Yoshi must use Baby Bowser to melt the ice to continue. First, there are tons of Gusties to get through, then Yoshi must navigate past Scorchits and slippery ledges. After the Scorchits melt the ice in the path, Yoshi must hit a Winged Cloud to create a ferris wheel, which allows him to get him across to more platforms until he can get through the door at the end. In Baby Wario's path, Yoshi must use Baby Wario's magnet to move metal blocks and solve puzzles. Once he manages to get the metal box up the elevator using the ferris wheel, Yoshi then needs to climb the metal platforms to get to the top, then he must push a metal box down the hole to get it to fall at the bottom of the elevator. 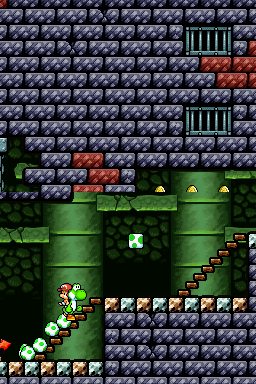 Yoshi must push the metal box near the wooden bridge, then bring the elevator back down. After putting the metal box onto the elevator, Yoshi brings it back up and sets it onto some spikes. After Yoshi gets the metal box across the pit of spikes, he must use it to flip a switch. After flipping more switches using metal boxes, Yoshi can finally exit through the door at the end. For Baby Mario's path, Yoshi must run as fast as he can to avoid getting crushed by the Super Big Tap-Tap. Some Gusties also try to stall the Yoshi. There are a few Shy Guys standing around after making it through the bumpers at the end, after that, Yoshi can make it through the door. Baby Peach's path is filled to the brim with spikes, so Yoshi must be careful while navigating it. The path consists of using Baby Peach's parasol to glide through the air. However this can be treacherous due to the spikes. There are several Winged Clouds, however, that create bridges so the Yoshi doesn't hit the spikes. After getting through some Blow Hards, Yoshi can make a hasty escape through the door. Baby DK's path is mainly jumping from vine to vine while collecting things such as coins and the like. However, Yoshi must also avoid the Fire Bars that are in his path before making it to safety at the door at the end. After getting through one of the babies' paths, Yoshi will make it to a room where it is a short walk to the Middle Ring and boss door. Upon entering through the boss door, Baby Bowser wanted the treasure that was in the castle and thought that the others were going to get the treasure, so he attacked them. After Yoshi defeats Baby Bowser, he is confronted by Bowser, who is furious that he attacked his younger self and battled him. After defeating Bowser as well, Kamek comes to Bowser's aid, turning him into Giant Bowser. A pink, yellow, and purple Yoshi will come together, and they, with all the babies (except Baby Bowser) fight Giant Bowser. They are each given a large Yoshi Egg. To defeat Bowser, all four eggs need to be thrown at Bowser at once. The only supply of big eggs the player has are on a balloon. Yoshi has to throw them six times at Bowser to defeat him. They eventually succeed at defeating Bowser, saving Baby Luigi, and freeing all the captured babies. If the player loses a life in the final boss fight while playing as Baby Wario, they will be unable to play as him if they decide to try again. This is because, after trying again, the player gets sent to an alternate version of the final room - the developers seemingly forgot to add Baby Wario to the lineup on the Stork Stop. Green Yoshi usually plays the first level of each world but he plays in this level, the last level of the world, just like in Super Mario World 2: Yoshi's Island. The English name is a closer translation of the Japanese name of its predecessor, King Bowser's Castle.